Chinese New Year, perhaps the most widely celebrated holiday in the world, is coming soon! Knowing how to say happy new year in Chinese will come in useful no matter where you happen to live. Families and friends will be sharing special food and time together; a whole list of centuries-old superstitions and beliefs will be observed to hopefully make the new year the most prosperous yet. With vibrant Chinese New Year celebrations taking place from Sydney to San Francisco, you'll have plenty of opportunities to show your respect and well wishes if you know how to say happy new year in Chinese! Find out when is Chinese New Year? Chinese New Year is huge. 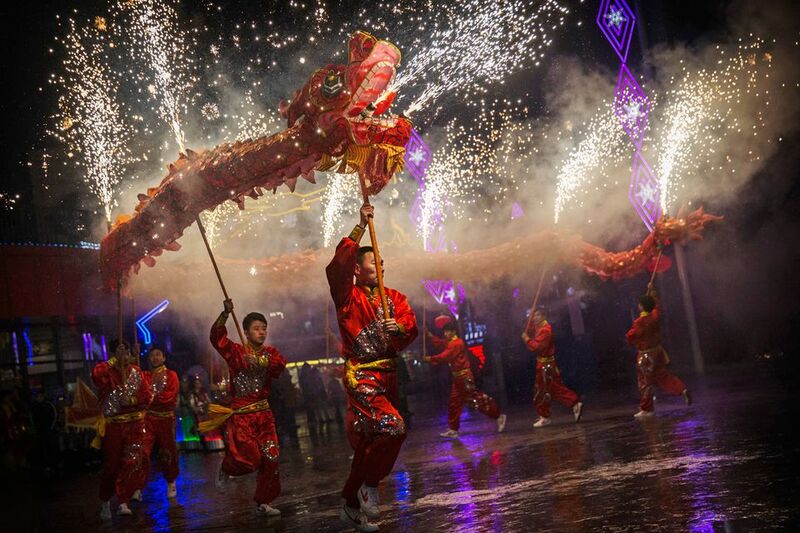 With people scattered around the globe observing the Lunar New Year, you'll find major celebrations with fireworks, parades, and festivities in nearly every major city. Although the first few days are the most observed, Chinese New Year actually runs for 15 consecutive days and ends with the Lantern Festival. Preparations take place for weeks in advance to ensure that the new year is filled with luck and prosperity. Chinese New Year is a time when families reconvene, share lots of food, and set the pace for the new year. Firecrackers are thrown in abundance to frighten away unlucky spirits, and red is worn -- even red underwear -- because of its symbolic meaning. Children receive small gifts and money in red envelopes, and various figures from history are honored. Read about Chinese New Year preparations. Unsurprisingly, with such vast variations in Chinese culture and ethnic groups around the world, there are many ways to say happy new year in Chinese. Unlike our New Year's Eve celebration in the West which tends to be about short-lived resolutions to improve ourselves, the primary goal of Chinese New Year traditions is to usher in good luck and prosperity in the new year. Many of the ways to say happy new year in Chinese are centered around luck and financial success. Pronounced "gong zee fah tsai," gong xi means "congratulations" and is also a way to wish one joy. Fa cai is to become rich or make money. In essence, you are wishing one joy and prosperity in the new year. Business owners and workmates use gong xi fa cai as the usual way to say "happy new year" in Chinese. Pronounced "sheen neean kwai luh," kuai le means "happy" or "joyous" and xin nian means "new year." Xin nian kuai le is a great way to say happy new year in Chinese to friends without using a reference to money. Chinese New Year greetings in Cantonese differ slightly than those in Mandarin, however, both are actually written the same way. Gong Hey Fat Choy in Cantonese is the equivalent of gong xi fa cai in Mandarin, or simply "congratulations and prosperity." Take your Chinese New Year greeting one step further by offering a polite hello to newly met friends before you say happy new year in Chinese. Ni hao -- pronounced "nee how" -- is the simplest, default greeting in Mandarin Chinese. Know how to show more respect in your greeting and how to understand the responses by learning how to say hello in Chinese.